The original birthday song is now the perfect gift book! Make a child's special day even more memorable with the fun illustrations in Happy Birthday to You!There's nothing more special to a kid growing up than their birthday. Leave those boring, old cards in the card aisle, because this is your chance to give the birthday girl or boy something truly unique. 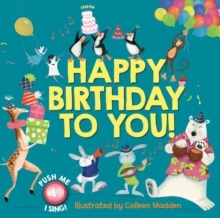 Happy Birthday to You features the original "Happy Birthday to You" song along with additional lyrics, and page after page of fun, clever illustrations from known artist Colleen Madden. Plus, the book includes a sound clip that plays the original birthday song. Both a book and a deluxe gift card, what makes Happy Birthday to You! a truly special gift is that it features space on the title page and inside pages for writing personalized notes or drawings. Happy Birthday to You! makes a great gift for birthday boys and girls of all ages.